Thursday July 12th 1883 I went to town this morning after I got the work done up and stayed at Hatts till nearly supper time. I helped do up the work in the evening and played on the piano Friday July 13th 1883 I was at home all day and we worked in the currants what time we could for the rain we were putting things to rights in the summer kitchen. The men are working on the barn now Aunty went home this evening. Saturday July 14th 1883. I was at home all day. Mother went to town in the forenoon. Hatt brought the children over and staid all night We put up some were currants today. 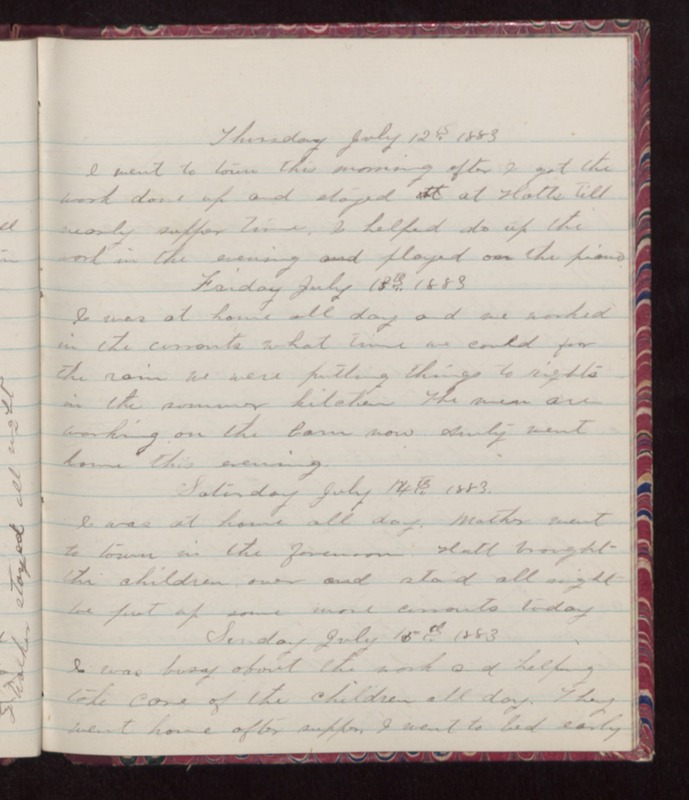 Saturday July 15th 1883 I was busy about the work and helping take care of the children all day. They went home after supper. I went to bed early.